[New for 2015] Since there's not a lot of name brand newness going on right now, let's check out some more of these 7-11 flavors. 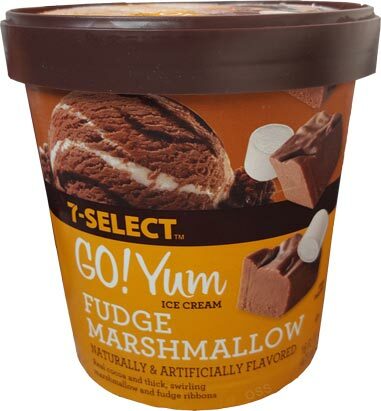 So it seems like it steals the fudge and marshmallow swirls from their s'mores flavor, but then packages it with just a plain chocolate base. Could be boring, could be excellent. Let's see. Grrrrrr, the fudge swirl is reminding me of something but my headache is preventing me from remembering what. 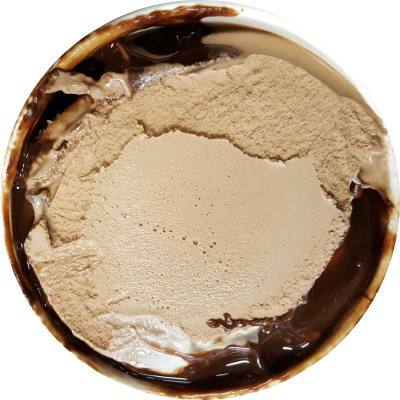 It's unique gooey texture still has a certain fun factor, but it's just not that exciting against a so-so chocolate backdrop. The chocolate base is just.... too flat? too dense? There's just something not quite right about it. 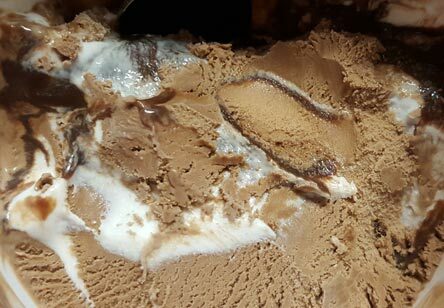 Just look at the picture, see how tiny the breaks are in the ice cream? Some times it doesn't even break. 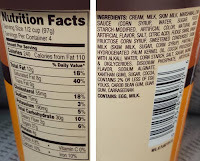 With something like all natural turkey hill ice cream, there is a wonderful breakdown that happens when you put the ice cream on your taste buds. This is more... foamy? spongy? Ahhh, no, those words imply soft, and that's definitely not right. I don't want to feel like I'm eating some dense sponge candy. Ok, yeah, I have no idea why you would pick this over the s'mores flavor. The base is just painfully inadequate here. It's not $3.99 good. $2.99 at best. Granted convenience factor, but, no, not working for me. Maybe if there were some almonds or chocolate chunks. The other flavors worked around the flat base, but here, it just stands out too much. On Second Scoop: Another day, another serving. You know what I realized? This stuff is dense, much like my experience with Steve's Brooklyn Blackout. We are all different, and many of you don't have texture issues like I do, but for me, it's too dense. It just feels weird on my tastebuds and doesn't convey the flavor like I want it to. Yes, the prevalent swirls are lots of fun, but they are by no means enough to carry the ice cream by themselves. I just bought this one.. I been wanting to pick one of the 7-Selext flavors up, and between this and Banana Cream pie, I chose this. I wish I hadn't. It is VERY dense, and I was eating it direct sunlight with Temps near 70+, which means it should have melted more than it did. By the end, I had a ball of ice cream, nearly completely frozen in the middle. I enjoyed the fudge more than the base. It tasted .. bland and weird. I kept wishing for a crunch or something to chew. Nuts, cookies, or even chocolate chips/chunks would suffice. Found to be absolutely the best ice cream I've had in a long time. Loved it!